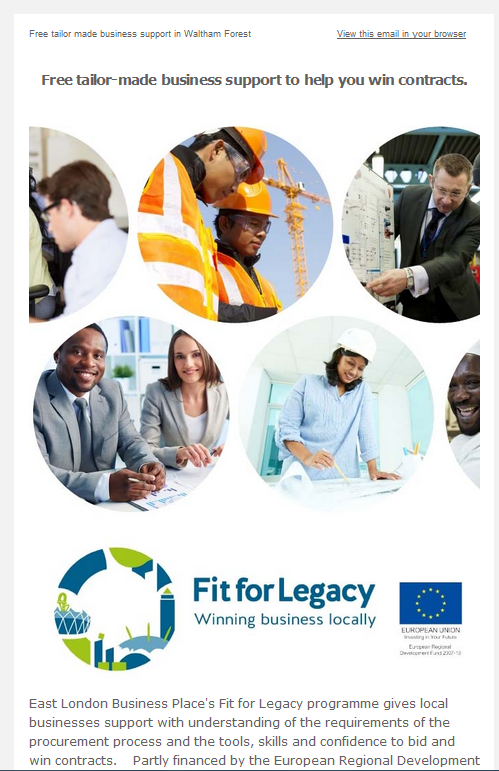 “We recently had the privilege to work with the Waltham Forest Business Network when we needed a strong and vibrant team to help market the benefits of the Fit for Legacy business support programme to SMEs in Waltham Forest, and to drive new and existing Waltham Forest Business Network members to a joint summer networking and information event we held with them earlier in July. Through the power of their social media and marketing networks, and the close working relationships that they so obviously have with the local business community, they set about the task of tirelessly and professionally spreading the word about Fit for Legacy, and consequentially getting over 80 SMEs to a fantastic evening event at Waltham Forest College. Additionally, the continued power of WFBN’s social media engines continue to advertise and promote our programme in the borough, and we are continuing to attract many new Twitter followers on a daily basis. Quite simply, the WFBN team delivered ….first time and on time, and I would have absolutely no hesitation in recommending them to any organisation who require their marketing or event management services …these guys get it!